I had never heard of Lucien Durosoir. The CD was part of the offers of an eBay seller from whom I buy a lot, and often blindly, taking advantage of bargain prices. I can afford to take a 5-dollar risk! In fact, based on the label, Alpha, I thought he was some obscure French composer from the 17th or 18th Century. Wide off the mark. Born in 1878, Durosoir is of the generation of Ravel (1875), but he outlived Ravel by almost twenty years (1955 vs 1937). He was also born the same year as André Caplet and they were close friends (they spent the war in the trenches together, certainly an experience that seals longlasting friendships, if you are lucky enough to survive), but he outlived Caplet by 30 ears. According to the liner notes, Durosoir was first a renowned concert violinist, having received the tuition of no less than Joseph Joachim (the notes don’t mention it but, apparently, he gave the French premiere of Brahms’ Concerto), and touring a lot in Germany. He had studied composition and counterpoint with Charles Tournemire and Eugène Cools, and had always harbored the desire to compose, but it is only when he came back from the war (having, in the trenches, received additional tuition from Caplet), in 1918, already aged 43, that he was seized with the urge to compose. The bulk of his compositional output dates from the brief period of peace between the two wars. The String Quartets were composed in 1919, 1922 and 1934. The liner notes (signed by Georgie Durosoir, who I suppose is Lucien’s daughter) draw a smile when they start Durosoir’s bio by the phrase (not translated to English) “it must be reminded that Durosoir was a concert violinist…”. To be reminded something, you have to have known it and forgotten. But I consider myself very curious and fairly knowledgeable in the “off-the-beaten track” of music, and Durosoir is “l’inconnu célèbre”, the unknown celebrity. In fact, he seems to have spent his post-war and compositional years in complete seclusion, and his works weren’t even published, which goes far to explain his total obscurity. Caplet, the erstwhile assistant of Debussy and an established composer in those years (and a great and sadly neglected one in his own right), expressed his deep admiration for Durosoir’s first quartet and promised to champion it – but then, Caplet died in 1925, and that must have annihilated Durosoir’s small network of supporters. To the hilt. The three string quartets are absolutely magnificent works, intensely, harrowingly lyrical, marked by a very intricate contrapuntal writing, with each instrument treated independently in a richly-woven fabric of melodious sounds. Ravel may come to mind at times (especially in the second movement of the first string quartet), but the language, while being nowhere avant-garde (of the time), not Schoenberg, not Bartòk, not even Milhaud, is more advanced than Ravel’s. The quartets are tonal, although Durosoir constantly pushes the limits of the envelope. There is a whimsicality and freedom of form that may remind of Florent Schmitt, another near-contemporary who lived a very long life (1870-1958). But the exacerbated lyricism of Durosoir also brought to mind, if occasionally, the quartets of Janacek (Finale of 3rd String Quartet) and Britten (3rd Quartet, first movement). There is, indeed, a kind of vehement jaggedness in the Third Quartet which, while retaining the border-of-tonality exacerbated lyricism, takes it closer to the avant-garde. 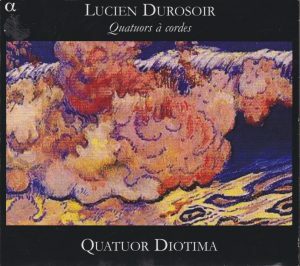 Listening to Durosoir’s quartets, with their ardent lyricism combined to the intricacy of their counterpoint, other reminiscences came to mind, although I couldn’t quite nail them down: was it the quartets of Villa Lobos? Or maybe those of Malipiero? Or maybe the chamber works of other French contemporaries like Vierne or Pierné or Roussel ? I’d need to go back to my music library and spend hours listening again to all those to check on my impressions. But if I am trying to come up with comparisons, it is not to imply that Durosoir’s quartets are derivative in any way, just to give an idea of how they sound. His quartets aren’t beautiful because they evoke others. They are magnificent in their own right, and the fact that they evoke others provides only provides an additional titillation. But they can be heard, and enjoyed, with no references whatsoever. 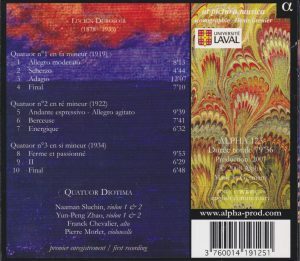 In the absence of any comparisons, I have nothing but praise for Quatuor Diotima, and gratefulness to them for tackling the unknown. Google-checking, I see that there are a number of websites devoted to Durosoir – only in French. The main one seems maintained by Durosoir’s heirs, and it is very complete, but hasn’t apparently been updated since 2016. It has, among many other things, an extensive bio with many photos, a discography, a catalog of works with first pages of the scores, and an online shop where the scores can be purchased, either physically or as downloads. The label Alpha, with three other CDs devoted to the music of Durosoir, must be lauded for taking such an active part in his (re)discovery. I wish someone would tackle his orchestral works as well.